Looking to get some sweet ab muscles before next summer? If you are thinking about adding a new machine to your home gym, an ab machine is a great way to go. These are dedicated to making your abdominals and other core muscles ripped and strong. Having a strong core makes everything in your life a little easier. A strong core protects your spine and internal organs, it helps with balance, and it can prevent you from suffering from back pain later in life. It will improve your balance, your stability, and makes other exercises and activities easier. If you want to strengthen your core, a sweet ab machine is a great way to do that. Why Use an Ab Roller? Different kinds of ab machines can cost hundreds of dollars. Make sure you know what you’re willing to spend before you even start looking around. What are your height and weight? Many machines have weight and height restrictions, so make sure that the one you pick is perfect for your body. Some machines are small or can fold easy to fit into closets or under beds; however, some machines do not fold or take up a lot of space. You’ll need to take note of the measurements of your room and ensure that it will fit in the space you have allocated for it. Also, remember that you’ll need a few feet around the machine as well for your body and its movements. Is it the right kind of workout for you? Some ab machines are more difficult to use than others. Make sure your new machine will fit your body, your workout style, and your fitness level. The Fitness Reality X-Class Light is an ab machine for every body! It allows you to get decline-style intense workouts at home without paying the gym price. This is a moderately-priced piece of workout gear, so you’ll make back your money from quitting the gym in no time. Designed with comfort in mind, all the surfaces your body will be touching are padded. It’s all also covered in moisture-resistant fabric, helping you to get the most out of your work out without sweating through the cover. The X-Class Light is 64 by 28.8 by 32.5 inches and weighs in at 55.6 pounds. This thing can handle weights of up to 650 pounds, allowing just about everyone to work out. It claims to support heights of up to 6’4” too! We like equipment that is designed for every body who wants to work out, and this equipment is sized to handle bodies of all shapes and weights. The cushioning! This thing is as comfortable as workout gear ever gets. It claims to have 2.5 inches of foam on the bench and cushy wraps around the handles, and it actually delivers. Although working out is hard work, you don’t have to make it harder by making it uncomfortable. The density foam on this bench works. The X-Class Light has a few points where you can adjust it, including the decline and the thigh-support cushion. And adjustable is always a good thing! It’s on wheels. They don’t get in the way while working out, but it makes it easy to move around. You just roll it into the closet on vacuum day or push it into a different room without having to carry it. Considering it weighs 56 pounds, that’s a boon for a lot of folks. The vinyl is moisture-resistant and easy to clean. Considering you’ll be sweating all over it, that’s a very good thing. This thing doesn’t fold up for storage. Once it’s built, that’s it. There’s no collapsing it and hiding it away when people come to visit. It’s not a small machine either, so make sure you have garage space or a gym room where it can live without getting in the way. There are no incline settings for the bench. It has a flat setting and three decline settings, but no incline settings. You should take that into consideration before purchasing. This product is great for the taller crowd, but not designed with shorter people in mind. If you are less than about 5’6”, you probably want to look for a machine that is built a little smaller. It’s adjustable, but not that adjustable. 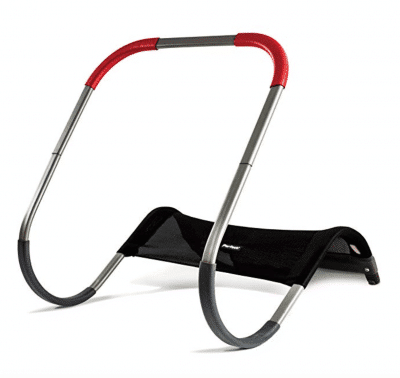 The Ab Coaster Max is designed for a great ab work out for any experience level. It works every part of your core. It weighs in at about 54 pounds. It’s solidly built to hold up to 300 pounds, and it works no matter your height. It’s heavy and stable, built out of steel to stay in place. It works by placing your knees on the sliding seat. Then you rock the seat up along the curve of the machine. It’s actually a very unique exercise! So let’s take a look at its pros and cons next. It’s a unique exercise that works every part of your core. If you’re looking for a complete workout, this is the machine for you. It works your abs hard, so make sure to start slow and work your way up to doing multiple reps. If your core hurts too much the next day, you won’t want to continue using the machine no matter how much you like the workmout. It comes with a DVD and booklet to ensure you’re doing the exercises correctly. Making sure you’re doing the workout the right way will ensure you don’t injure yourself while working out. It even comes with some dieting tips and recipes to help your ab-blasting results even faster. The sliding motion makes it easy to do, even for beginners. You will find that simply adding reps makes the exercise more and more difficult rather than making a bunch of adjustments for everyone who is using it. The body of the Ab Coaster is made from durable steel. It has quality parts that are covered by a manufacturer’s warranty. High quality means less likely it will break down or wear out. This machine comes with wheels on the back, so you can move it from room to room with ease. It’s a pretty heavy machine at about 55 pounds, so the wheels can help immensely. If you want to store it in one place and use it in another, you’re all set to move it then groove it. You pay for what you get. This machine is stable and made from steel, but it is on the higher end of the price point for ab workout machines. While the quality is pretty high, you still want to make sure that it falls within your budget. While working out is important and a great way to get healthy, you shouldn’t go into debt trying to buy workout gear you can’t afford. Stress from financial woes isn’t healthy either! The customer support is less than stellar. Many reviewers of this product complained that if a piece was damaged or missing and they had to contact customer support, the people were MIA or not very helpful. This may have been fixed by now, but it is something to consider. 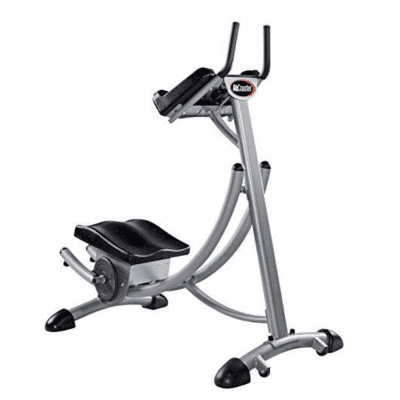 The Daiwa Felicity Compact Core Trainer is a simple-looking machine that uses a rocking motion to give you a full-body workout. The motion is similar to a rodeo, horse-riding motion. 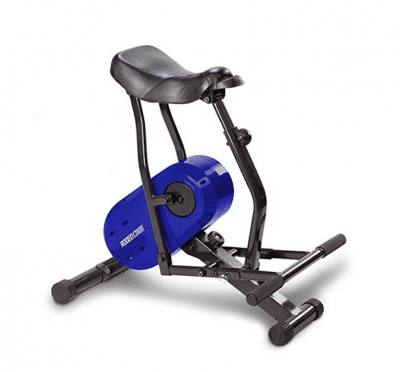 This machine not only works your core, but it is also aerobic exercise too. So if you only have room for one machine in your whole house, this kind of all-inclusive exercise would be a boon for you. This machine is also on the more expensive side of the spectrum, but I think the workout is interesting and unique, so we had to show it to you. A real full body workout. The twisty motion feels like it’s working every single muscle in your core, legs, waist, thighs, and some other pieces too. That means your getting more exercise for every minute you spend on it. And I love working out more muscles in less time A few minutes on this thing and your core, your thighs, your hips, and your legs will begin to feel the burn. Just don’t overdo it! This thing doesn’t need a single watt of electricity. You can do it anywhere, at anytime, with only the power of your body. No wondering where the closest plug-in is or not being able to work out when the power is out. I think that’s wonderful; I hate having wires running across my room while I’m using Compact Core Trainer. It’s pretty small and lightweight, making it great for small spaces. You can even store it away in between uses. Anything workout gear that you can hide out in a closet when you’re having a dinner party is perfect for me; I like my home to be less cluttered, not more. It has height adjustments to make it the perfect size no matter what your height is. This means that everyone in the family can use it, from your older kids up to the parents or grandparents. Anyone who lives in your home will be able to adjust it so it’s perfect for whatever their height happens to be. The seat is not as padded as you might want it to be. It has the feel of a bike seat, and it can become uncomfortable very quickly (although not all bike seats are uncomfortable). I personally like a lot of padding to support me, especially when I’m working out hard. The seat looks like it was designed for skinnier people, and people of weight might find it less than supportive. Another size complaint: The machine is not very wide. If you are a bigger person trying to work out, this machine might make you feel like no machines out there are built for you. Although this can be fixed by adding additional padding to the seat. I’m not a huge fan of workout gear that’s marketed as something to “help you lose weight,” but then isn’t comfortable for those who are actually overweight. It seems a little hypocritical to me. 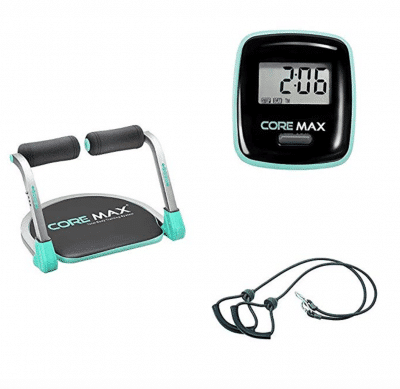 The Core Max Ab Machine is a very inexpensive and tiny option for people with little room and a small budget. It rocks to give you the perfect sit up or crunch. The machine is wonderfully simple. It comes with resistance belts and a timer to make sure you are working hard and keeping track. It has a weight limit of 220 pounds but fits just about any sized body. At only about 18 inches by 18 inches, it’s the smallest machine on this list. This product is easy to use. It works out your core on the way up and the way down, giving you twice the workout in the same amount of time. It’s one of those things that’s difficult to do wrong, which is wonderful. Any exercise that is easy to do right equals less of a chance of injury from doing it wrong. It’s so simple, almost anyone at any fitness level can do it. So if you are a beginner who hasn’t worked out in years (or ever), you’ll still be able to use this machine. And if you keep with it, you will get results. Simple as that. This simple machine is small compared to most workout equipment; it can be stored just about anywhere. This means you can work out even if you’re limited on space or don’t want to have to see your equipment every day. So if you live in a small apartment or are short on space, this is the smallest machine I can recommend. The slip-on bands give you a little extra resistance when you need it. So if you find the workout starting to get too easy, you can add a little more difficulty to your situps. The resistance strips are easy to install and to remove when you need them. The Core Max is incredibly inexpensive compared to most models. If you have just a small amount of money to spend on your home gym, this might be the best way to go for you. It costs about the same as one month at the gym, which means it will pay for itself in no time flat. It doesn’t provide enough resistance for many people. In spite of the fact that the resistance bands are supposed to add difficulty to the exercise, most people with established core muscles think this machine isn’t enough. If you have a long way to go to get to your fitness goals, it would be a great machine for you. You get what you pay for! This is a cheaper model, but it’s not always in the best condition when you receive it. It also won’t hold up as long as most ad crunchers that cost a little more. Roll bars aren’t super padded or comfortable for working out. These could stand to use more quality materials to wrap the bars. The Perfect Fitness Crunch is like training wheels for the perfect situp. It teaches you how to do a proper crunch, holding your body in the best position to get great results with less risk of injury. You can also flip it over and use it to do the perfect crunch or perfect dip. It’s a small, simple device made with no moving parts. It’s 28 x 26 x 25 inches and weighs in at about 6 pounds. This is a very inexpensive model. With no moving parts and just the bare necessities needed to give you the perfect crunch form, you won’t spend a whole lot on this product. You can do multiple workouts with one simple device. Just grab it, put it in front of the TV, and do your pushups and situps while you watch your favorite show. No pulling out several machines or dropping a whole lot of dough on a full gym membership. Just simple and effective workouts that target your core and your upper body. 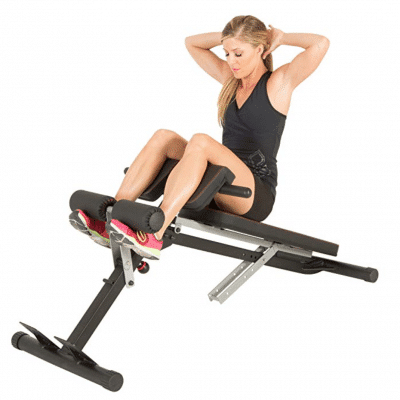 The design is made to protect you from the ill effects of doing crunches incorrectly. While you may think you are doing them right, it’s easy to strain your neck and shoulders. It makes it safer than doing crunches or situps without a machine. It also helps to prevent you from using momentum to pull yourself up, making your workout more effective. It’s lightweight and easy to move too! You can up the intensity by changing your leg position. This machine is a workout for anyone. It can be a basic crunch or you can add more reps and engage your core even more by lifting your legs. I like how very little goes a long way here; this simple looking machine does so much for what it is. While it is lightweight, it’s also kind of large. It doesn’t fold up, making storage a little more challenging for some. If you don’t have closet space or a dedicated gym area at home, I hope it matches your living room decor. It is cheaper, and therefore not made of the highest quality materials. It won’t hold up for years and years like some of the more expensive models. This machine is a little difficult to put together. While most of these machines were simple to put together, this one is not as simple. When it comes to the Perfect Fitness Ab Carver Pro, we can say that the biggest difference maker is what the producer calls a “kinetic engine”. It’s actually a carbon steel spring that ensures resistance as you extend and assistance when rolling back. Another positive is its increased wideness. This helps the users keep better balance, and it can also be used at an angle, which is an ideal way of developing the side abs (oblique muscles). 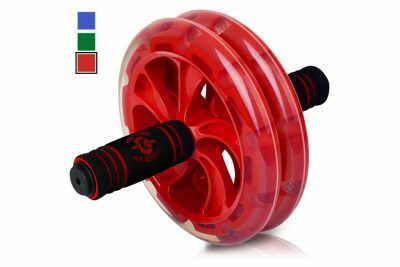 Moreover, the hand grips on this wheel are designed not only for improved stability, but also to stimulate arm and back muscles during exercise. This wheel actually helps train most of your upper body. The materials used are of a superior quality compared to most other wheels. Rubber is used on all the “contact” parts of the wheel. The wheel itself is gentle to any floor type, while the hand grips ensure great comfort and reduce slipping chances. What’s more important is that the producer offers a well-made, downloadable 21-day plan that is aimed at users of all levels, from beginners to advanced. The downsides of this equipment are its higher price as compared to the competition (although as of the time of this update the price has been reduced by over 30%) and lower worldwide availability. The official website allows orders only within the US and, while you can find the product on websites like Amazon, the availability, transport fees and shipment times vary with location. In the end, we can safely say that this is clearly one of the best ab wheels on the market. If you are in a position where you can buy one for a reasonable price, this is potentially the best choice for your money. Fortunately, the high quality can be felt all around. The build quality of this ab roller is excellent, inspiring confidence that it can last for years of consistent use. Apparently, the wheel frame is made using industrial strength polymers, and the axle is made of stainless steel. The manufacturers are so confident in the ability of this product to sustain great amounts of pressure that they are offering a lifetime replacement guarantee for any of its parts, in the event that something does break in the end. Besides strength, this product offers one of the highest levels of comfort we’ve seen with its hand grips. The material feels good in hand even after extended use, and we found its anti-slip properties to be very satisfactory. The rubber on the wheels is high quality as well, providing good performance on any typical surface, without causing damage or high noise levels. The balance and stability provided by the two wheels were also strong points of this ab roller. We just felt confident in using this ab roller in various ways, as opposed to other pieces of equipment with cheaper build quality. The resistance the wheel poses was proper to ensure the workout advertised: the entire upper body benefits from using it. There are not many negatives, but they are worth mentioning. The package that you receive with this product is quite basic. Besides the wheel components and a decent mat, there is nothing to be found. At this price range, you would expect some instructions regarding proper usage, some workout plans, perhaps even some extra items like resistance bands or travel bags. 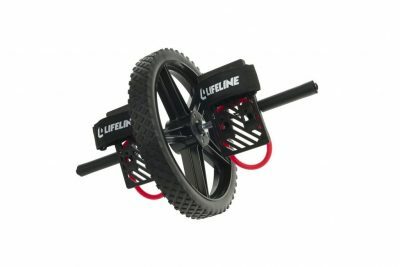 The Lifeline Power Wheel is one of the most interesting propositions we’ve seen, yet it doesn’t quite manage to live up to its potential. The benefits are there: this equipment really offers the possibility of doing an impressive amount of exercises with benefits on numerous muscles in your body. 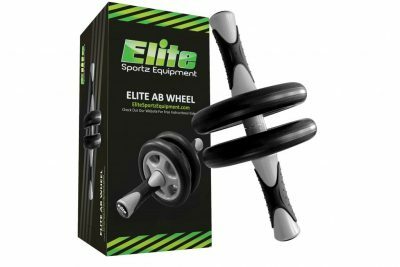 The rubber wheel is sturdy and grips well, providing a good feeling and sense of balance no matter what type of workout you choose to do. The online videos available from the product’s creator are also of the highest quality we’ve seen lately. This ab roller certainly pushes the limits of what you thought an ab roller can do and helps you work muscles you didn’t know existed. Yet, there are some build issues that drag what should be a piece of excellent equipment down. First and foremost, both the hand and foot grip materials could be of higher quality. The added foot grips open up a whole new range of motion compared to other ab rollers, but you’ll find them a little akward to use. The hand grips are also not very comfortable, making it more difficult to use than is necessary. People may also be disappointed when they find almost no information in the package, namely instructions as to how you should assemble it. All that said, this is one of the best, and certainly the most unique ab workout machines we’ve used. And coming in under $40, it’s a piece of equipment worth adding to your home gym. The product has an interesting potential but it only lives up to part of it. The best aspect is that the exercise possibilities are unique indeed, offering some interesting variations in your core workout routine. However, it was sad to see just how little content and detail there was in the workout guide. We had to look online for more types of exercises suggested by regular users. Clearly, there were times in the past when there wasn’t much available besides the poor official information. The grip these wheels provide is decent, for the most part. But we did have some issues with smooth surfaces at times. We can only say to have mixed feelings about the wheels. Another thing that bothered us was the cheap feeling that the foam on the handle gave us, showing signs of wear after only a few days. On the bright side, we found the handle itself to be quite strong and reliable in our tests. 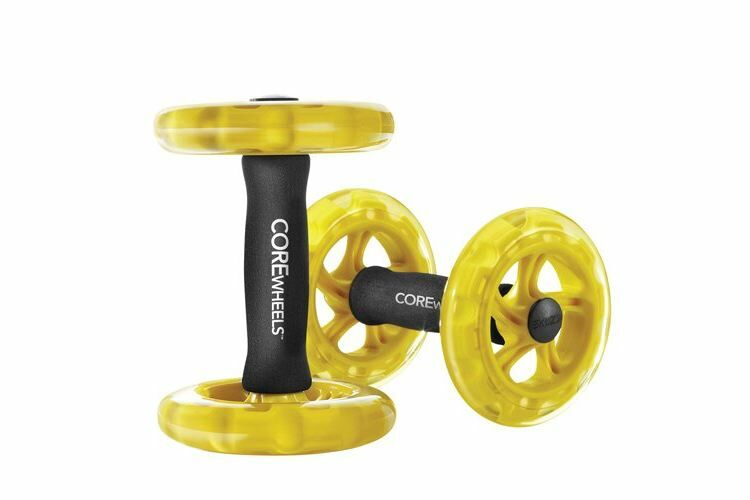 When it comes down to a verdict, the SKLZ Core Wheels remain an interesting product if you want something different when training your core. But a few issues regarding the materials used and instructions offered manage to bring it down a few notches. Still, I like the variation offered by dual rollers vs the single roller style. 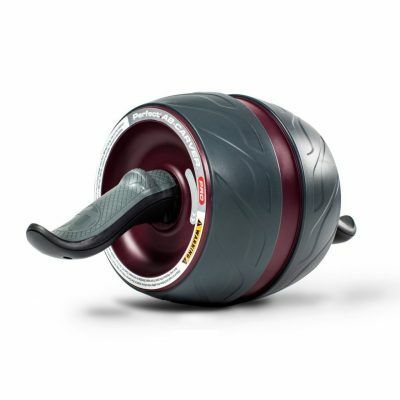 The Ab Wheel Roller Pro stands somewhere between entry and mid-level in terms of price. After opening the package, you can indeed see influences from both segments. The first thing to notice is that there are no extra features in the package: no knee pad, no instructions – just the wheel itself. This is typically seen when it comes to entry level products. Second of all, the materials used feel cheap. It’s not that we expected anything besides plastic at this price range, but we’ve seen better quality than here. The handles were another problem we had with this product. They just weren’t comfortable at all after extended use and the grip was not satisfactory either. We felt that our hands would sweat more than usual when using this particular ab wheel. If you feel that you have the same issue, we recommend using a cloth over the handles. It should provide a softer feeling to your hand and help with the sweat. The small wheels also made the product less comfortable than we would’ve liked. What we enjoyed in this area was the distance between the wheels, which helped ensure better stability overall. There are other good things to be said about this product as well. The ab wheel does a good job of providing a proper workout for the upper body. Anyone who has used products of this kind knows perfectly well the feeling you get in your muscles afterwards – a sign that they work, which is something very noticeable in this case. Back to a previous statement, when we said the materials feel cheap, our complaint was regarding comfort. The construction itself seemed decent based on the time we spent using the product. While we can’t guarantee how it behaves in the long run, it didn’t give signs of being about to break in our tests – and we tested larger body weights as well. And with the lifetime replacement guarantee, you do have good value for the money either way. Overall, we feel that the Ab Wheeler Pro is a decent product for its price. That said, it is a bare-bones product with no knee pad and little to no instructions included so buy with caution. Building rock-hard abs requires utmost dedication to losing fat and toning your tummy through aerobic exercise, a balanced diet and a lot of challenging core workouts. If you’re sick and tired of the monotony (and weak results) of crunches, grab yourself an ab roller. There are a number of slew of health and fitness benefits related to this simple piece of equipment. The primary purpose of an ab roller is to strengthen your core muscles, together with the rectus abdominis located in the stomach area. Distinct from other types of exercises which usually target only one muscle or muscle group, the ab roller involves nearly the whole upper body and even parts of your lower body. Your obliques, pectorals, triceps, deltoids, and many others will all be joining the party. Whenever you use the ab roller, your core activates to prevent your back from arching. In addition, your spine flexes to contract and stretch your abdominals through a full range of motion. Such movement presents a huge challenge to your six-pack, the rectus abdominis, and the spinal stabilizers. All these muscles can be targeted by the ab roller, thus making it an excellent tool for a stronger and more sculpted core. Ab roller rollouts strengthen a long list of muscles. Some core workouts only engage a small number of muscles. For instance, crunches only work your abs and obliques. For the ab roller, every repetition of the rollout exercise activates almost 20 muscles. Although it is marketed as an ab-sculpting tool, the ab roller makes virtually every muscle contract because you need to stabilize your body in a plank-like position while rolling out. Aside from the abdominals, it also targets your pectorals, triceps, trapezius, lats, hip flexors and glutes. Strength-training workouts, including those with the ab roller, improve your overall fitness level in a variety of ways. Commitment to this type of exercise boosts your stamina, improves balance, helps manage weight, prevents several diseases, strengthens muscles to minimize risk of injury, and even reduces anxiety. Building strong, toned muscles also have positive effects on your confidence and self-esteem. While exercising with an ab roller may not burn as many calories as with cardio training, this type of exercising still plays a significant role in burning fat and calories. Boosting your muscle mass imminently elevates your basal metabolic rate, which is the rate at which your body burns calories when you’re not engaged in physical activity. Research shows strength training on a regular basis may increase your basal metabolic rate up to 15 percent. Strengthening your core even if you don’t get the much-coveted six-pack is beneficial in several ways. A strong core will help you perform a number of daily movements with relative ease. It can also provide relief if you often experience low back pain. Whenever you do the ab roller rollout, you extend your spine, decompressing the spinal nerves and reducing intervertebral pressure. The first time you use an ab roller can be a humbling experience. You grab the handles, roll the wheel in front of your body, and likely fall flat on your face! Of course, that is not how it’s supposed to work. If you have a strong core and a good technique, you can roll the wheel out and then pull it back in, slowly and perfectly under control. However, even with a correct technique, this exercise is tough to execute so don’t get discouraged. The first thing to do is practice activating the right muscles. When you move the ab roller, extend it only as far as you can control it. With some practice, you will never fall flat on your face again. Start on your hands and knees. See to it that there is unobstructed floor space that’s at least equal to your height. Use an exercise mat under your knees for comfort. Your range of motion is likely to be limited at first, but you still need ample space. Roll forward and activate your abs. Grip the handles with both hands and prepare to roll. Move forward from your core. Slowly roll your arms and torso forward until shortly before you feel like you can no longer pull yourself back up. During the course of the movement, keep your abs tight, the lower back muscles contracted, and your hips stable. Don’t let your back arch and try not to let your bottom sag toward the floor. Hold the position for 2-3 seconds. Keep in mind that the longer you hold the “rolled out” pose, the more intensively you’ll be able to target your abs. Return to your starting position. After a pause at the stretched position, use your core muscles to slowly pull the ab roller back toward your knees. Breathe out and keep your abs tight the whole time. Once you’re back to the starting position, you have successfully completed one “rep” of a standard ab roller exercise. This is ideal if you are using the ab roller for the very first time. It will help you understand how to grip the roller while maintaining balance. Step 1: Start in the push-up position. Step 2: Hold the ab roller with both hands with your body in a plank position. Hold it for 30-45 seconds then repeat 4-5 times. Step 1: Start in the kneeling position. Step 2: Hold the handles with both your arms stretched. Step 3: Roll forward, stretching your body until it is parallel to the floor. Step 4: Lower your body far as you can without touching the floor and inhale during this movement. Step 5: Pause for 2-3 seconds then roll yourself back to the kneeling position. Exhale during the movement and don’t arch your back. Repeat the cycle. The V roll-outs focus on the obliques and are basically the same as the knee roll-outs. The difference is in the extension which must be performed at an angle of 45 degrees. Step 1: Begin by holding the handles while kneeling. Step 2: While keeping your arms extended, slowly roll out to the right. Return to the starting position and then roll out to the left. Repeat the cycle by alternating sides. For this variation, you’ll need to be in a plank position but this time it would be your feet on the handles instead of your hands. You’ll need a foot strapping attachment for this particular exercise. Keep in mind that your hands must be straight and positioned under your shoulders. Roll in the wheel by bending your knees and pull it closer to your chest. Maintain a straight body so you can attain higher efficiency and extend your knees back to the plank position. This helps to activate the abs, obliques, arms, and shoulders. Tip: Inhale when you bend your knees and exhale when you extend your knees back to the plank position. This is the advanced variation of the kneeling roll out or the double arm rollout. Here, your body weight is supported by your rolling arm, while the stabilizer muscles keep you upright. Your other hand, which is not in use, is ideally placed at the back of your waist. You can either do this kneeling or standing. Initially, the kneeling version is preferred because it will give you more control over your posture. Step 1: Start by bending your waist to hold the roller with one hand. Step 2: Begin slowly by rolling forward, concentrating on your core. Step 3: Return to the starting position by rolling back with one hand. Tip: To achieve better results, use alternate hands to repeat the cycle. Hold for 2 to 3 seconds when your body is completely stretched. Wherever there’s good, there’s also some bad, and the ab roller is no exception to this rule. The fundamental advantage related to using the ab roller is the fact that it applies enormous pressure on your lower back. In the case in which your back muscles aren’t the strongest or your hip flexors are increasingly tight, you may encounter difficulty in opposing the gravity effect on your abdomen while exercising. That will imminently result in an overarching of your back. If you wish to prevent injury, experts recommend you to strengthen the back by doing exercises that target that section. For instance, you could opt for lovers or rows, before actually moving up to the ab wheel. Note that, in the case in which you have issues with your lower back, you should avoid the wheel unless your health provider doesn’t advise you to.